If you're vegan and spend any time online, especially on YouTube, you've probably come across Earthling Ed - an activist known for his speeches and for debating people in the street about the morality of eating animals. If you're unfamiliar with his activism work, have a browse here - whatever form of activism got you into veganism, whether it was direct or indirect, it's easy to appreciate a good old-fashioned debate, especially when done as articulately as Ed. A couple of years ago, he co-founded Surge Activism - a creative grassroots animal rights organisation promoting compassion towards non-human animals - which (if I remember correctly) is currently in the process of registering as a charity. In order to raise funds for Surge, Ed has now co-founded a non-profit eatery serving a range of diner favourites, from burgers and ‘chickken’ waffles to baked cheesecake. Unity Diner is in Hoxton, tucked around a slightly quieter corner of bustling Shoreditch but, when we visited, there were still four tables full, even on a drizzly weekday afternoon. We didn’t manage to nab the prime spot by the beautiful mural - next time! I headed to Unity Diner with my friend Nat and her husband Jon, who went vegan last year. Nat is one of those wonderfully receptive and strong-willed people who doesn’t talk the talk without walking the walk. We were casually chatting on Snapchat (RIP Snap) a couple of years ago about food, when she asked me what the deal was with vegans not eating meat and dairy. My thumbs got carried away and, a few paragraphs later, she replied in shock and promptly decided she’d never eat animal products again. Just like that. And Jon followed suit. I’ve been on several great vegan dates with Nat since! Juicy B12 patty, melted cheeze, fried onions, grilled peppers, sun-dried tomato pesto, basil mayo, beef tomato and rocket in a pretzel bun. £12, with added ‘bakon’ for £1. This was Jon’s choice, and I had a bite. It was my first time trying the Moving Mountains burger, and now I’m set on trying an entire one for myself - I’ve seen a few restaurants offer them now and, from my one bite, I think it lives up to the hype! He added a salty strip of vegan bacon too. Jon got a side of Chunky Fries, which I happily helped eat when he was full from the burger. These were really good chips. Deep crunch, soft inside. Perfect. The Chunky Fries are £3, plus ‘cheeze’ for £1. Ale-battered firm tofu wrapped in nori seaweed, layered with tartar sauce, coleslaw, fried onions and baby gem in a sourdough bun. £8, plus ‘bakon’ or ‘cheeze’ for £1. This is what Nat went for - crispy battered tofu and the all-important seaweed to give the burger a fish-like taste. She loved it, and I think the cherries on top of the burgers are a really nice Unity Diner signature! 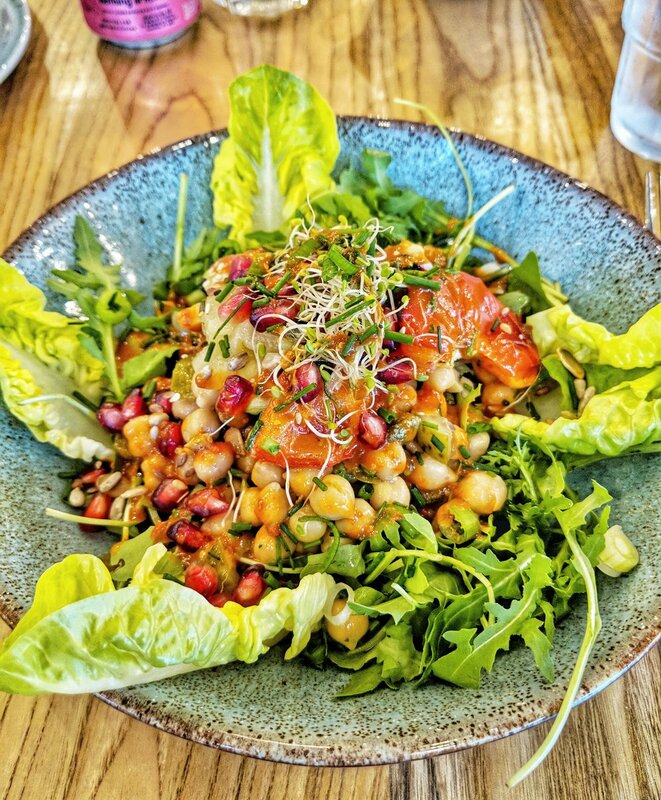 Chickpeas, grilled veg, olives, capers, sun-dried tomatoes and gherkins on a bed of baby gem & rocket, topped with pomegranate, seeds and dried fruits, drizzled with a superfood dressing, £8.95. I ordered the Epic Salad for myself - mainly because, the day before, I’d eaten my bodyweight in white pasta polished off with a vegan Magnum. I was fairly happy with it, but I think it could be improved with a thick tahini dressing - and more dressing full stop would be great! I was also hungry by the time I got home, but I’m fully breastfeeding a 7-month-old, so it’s my own fault for not ordering more food. If not a tahini dressing, avocado would be a good addition to this salad. I’d probably get a side of sweet potato fries if ordering this again. The full Unity Diner menu can be found here. I will 100% be back here soon! It’s such a great example of starting with a purpose that’s greater than the self (animal rights activism), assessing how the public’s needs can be met (food), aligning the two and turning it into a business where profits get churned back into the cause. Talking to Plantbased News prior to opening, Ed said, “My vision is for people to come into the diner, eat delicious vegan food and on their way home come across the advertising campaign that they’ve just funded through their meal”. Who wouldn’t want to be a part of that? Have you eaten at Unity Diner yet? What did you think of the food?